No, Named is also for Name Dog. Yes, fans, that's right. Our first (and hopefully only) dog naming contest is now in session. As you may have found out from Ellie Mae, we have been blessed by the gods of the unwanted. Living in the country makes you a target for doggie dumpers. And having a soft spot for dogs doesn't help. We had 2 wander up over the weekend... and they are still here. Guess what? I think we are theirs. We are trying to think of names.... One is a female golden retriever. Not ancient, but no spring chicken either. The other looks either like a dog instance of a clown... or maybe a doggie instance of Tommy Chong. We even considered calling him Steve (from Steve Buscemi's character in Fargo, who was described as "Funny looking. You know, in a general sort of way.") 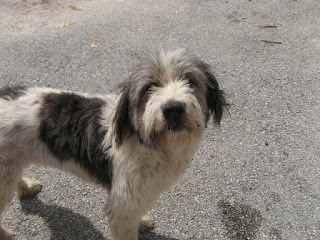 He might be a sheared old English sheepdog. Or just a funny looking stoner dog. So, we need names. 2 of them. Gotta match these faces. Ready, set, go. How about Goldie and Russell after Goldie Hawn and Kurt Russell? 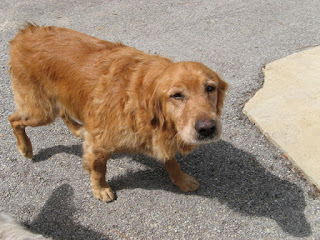 The retriever, with only one eye, no tail and three legs should answer to 'Lucky.' Oh, I see she has all four... nevermind. Maybe Pancho and Lefty, as I think the rough looking retriever is an Obama fan. Oh, sorry, Pancho brings back bad memories, doesn't it? I guess John and Sarah would be a great contemporaneous moniker. They did wander on to the scene at the same time, now didn't they? How about Gracie and George if in keeping with comedy duos of the male/female variety? So, Spork ... whatever happened to Syndrome? I double dog dare you! Donna can send any and all Thai creations my direction for critiquing ... no charge. Sorry I didn't get a chance to drop by the stump farm (maybe you are relieved) when I was near ... time didn't work out. Or how about Scaramouche for the clown like subject and Lindie or Lindy for the retriever? We theme named our two dogs after a restaurant back in NC that I went to once in a while, "Mac and Maggie's"
I find it best to name the pooches after a personality trait. While that may be cool in some instances, "Humper" is usually not a good idea for a male dog name. Hey, what about "Stay" (come here, Stay. Sit, Stay. Fetch, Stay.) I think that has possibilities.